Back in February, it was hard to miss the news of the giant crane that toppled in the middle of Manhattan, which killed a 38-year old Upper West Side resident. That crane also injured a 73-year-old retired businessman from North Easton, Mass., who was a cycling enthusiast and also enjoyed other outdoor recreational activities. The injured man now requires assistance to get around due to the extensive physical injuries he suffered as a result of the fallen crane. He has slapped New York City with a $30-million-dollar lawsuit. Three people, including the plaintiff, were injured by the crane collapse. 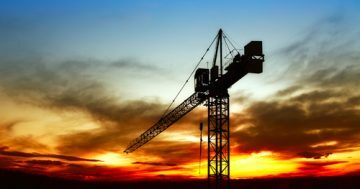 On the morning of February 5th, the plaintiff was sitting his Jeep that was parked, when a 565-foot tall crane came tumbling down on the street and his vehicle. The plaintiff’s injuries included a skull fracture, two spinal fractures, and injuries to his neck, back, arms and legs. He also needed a lot of stitches for his wounds. The plaintiff’s legal team claims the injuries could have been avoided if the Department of Buildings (DOB) had paid attention to and taken action on weather reports of high winds. Forensic evidence indicated that winds were at approximately 40 mph that day. The manufacturer of the crane, Bay Crane, has been sued before over faulty equipment. The plaintiff’s lawyers say he plans to sue the crane company as well as the contractor Glasso Transportation and Logistics, owners of the building where the crane was positioned, and the DOB. Interestingly, in a move possibly related to this case, Mayor de Blazio proposed issuing a ban on the operation of all crawler cranes in winds over 20 m.p.h., and fines up to $10,000 for violations. However, a city work group has criticized that proposal. Just like filing a personal injury claim against an individual, a city, town, county or state government can also be sued when accidents are caused by negligent, careless or reckless actions. Short Time Limits – Statute of limitations don’t apply. Instead, each governing body has its own fixed time line required to take action to seek compensation in any type of lawsuit against that particular governing body. They will range anywhere from 30 to 120 days. It’s best to look on the governing body’s website or rules and search for their personal injury state laws section. Notice of Requirements – In each governing body situation, you’ll have to file what is termed a Notice of Claim. If you do not submit this, many courts will dismiss the matter outright. This is a very technical undertaking and will require an experience personal injury lawyer. Any lawsuit filed before a Notice of Claim period expires will be dismissed. Government Immunity – Certain personal injury claims may not be filled against a government entity. Again, a knowledgeable personal injury lawyer will know what each specific government is immune from. Have you or someone you love been injured by another party’s reckless, careless or negligent actions? If so, you can turn to Kingston Personal Injury Lawyer Charles N. Rock for help with your recovery. Call our firm at (845) 383–1170 or email us using the contact form on this page to set up a free initial consult and find out more about how we can help you. To ensure that you have the legal support you need now, Attorney Charles N. Rock can meet you at your home or a hospital when needed. Our office is based in Kingston, but Charles N. Rock provides the highest quality legal services throughout New York.